For those who may have missed this detail from the HP book and/or movie, the Weasley clock is a magical JK Rowling invention that tracks each Weasley family member’s location and displays it on an antique clock face. Rowling thought it up, and a Muggle made it real. How cool is that? So with thanks to my friend, today’s installment of #ThingsILike is the real-world power of fiction. There are a lot of discussions of this topic out there, both contemporary and historical, but it’s a point I like to touch on periodically. A writer imagines a thing and someone else finds a way to make it real. How to get into space? Excite the minds of young (and not so young) people with stirring tales of adventures in space. This applies to stories from Asimov, Clarke and other Golden Age of Science Fiction authors, but also to more recent blockbusters like Andy Weir’s The Martian. If you want to understand why it is that NASA loves The Martian and is so gung ho for this movie, you have to realize that this movie more or less presents exactly their future vision, minus all the drama. That’s the power of fiction. * There may be other such clocks out there (in fact, I hope there are) but this is the version that caught my attention. Feel free to build more! This essay provides a fascinating look at the HI-SEAS (Hawai’i Space Exploration Analog and Simulation) Mars training mission from the inside. Written by Kate Greene, a science and technology journalist (i.e. not an astronaut), the piece gives a great inside look at what a trip to Mars might be like. For speculative fiction writers, this sort of research provides terrific insight into what life in space would actually feel like to those living it. Find the full essay at aeon Magazine. 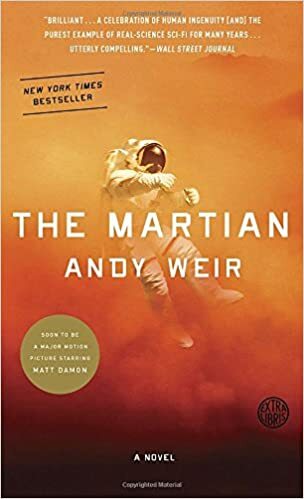 For more on the pitfalls of life on Mars, you could also check out Andy Weir’s recent novel The Martian.